Michael Jackson among many things, was known as one of the world's greatest humanitarians to have ever lived and as his fans, its not surprising that we strive to carry on his humanitarianism in honor of him, his name, and his legacy. Together as a group we've done many things in Michael's loving memory, the most distinct of accomplishments are the roses for Michael's anniversary in June, and the humanitarian acts we carry out in his name in honor of his birthday. In both 2010 and 2011 the people in this newly reformed group raised a total of 7,500 roses(3000-6/25/2010 and 4500-6/25/2011) for Michael's anniversary. 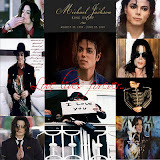 We also participated in charity projects in Michael's name such as planting 1000 trees in Michael's name for his birthday in 2010 and raising money to provide food and presents for the needy for Christmas in 2010. Sadly, our list of accomplishments is lacking one of our greatest feats. For Michael's birthday, OneRose4MJ's(old group) administrator, Sofie Strandberg informed us that we'd be collecting donations to immunize underprivileged children thru UNICEF. We were told at that time that it would cost $2USD for each child to be vaccinated for Measles, Polio, and Tetanus. However due to certain events and after further research, we have now discovered that the amount Sofie Strandberg quoted as the cost was greatly inflated. Accordingly, it would take 67 of these $24 gifts to immunize the 5,353 children Sofie quoted. A purchase of 14 of this gift would have provided the quoted 5,353 children immunizations against this disease. 80 gifts of this vaccine would have covered 5,353 children being immunized. When we donated, we donated in increments of 2 with the total faith that the price we were being quoted, $2 per child, by Sofie Strandberg was accurate and truthful. This means as a group we had raised a total of $10,706USD for this cause. 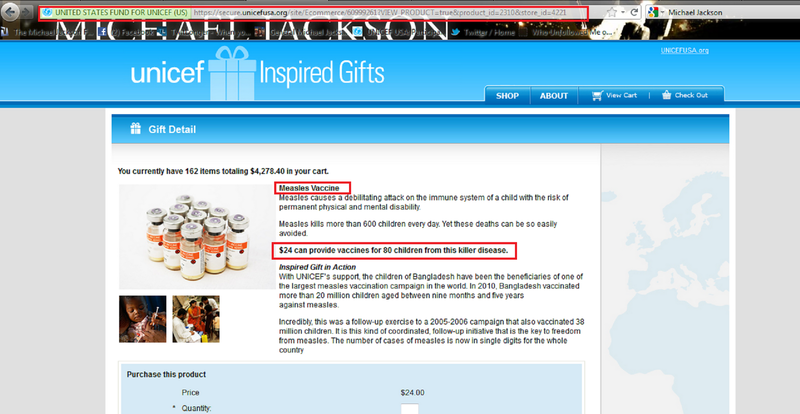 However, as you can see in the image below, once you enter the qty of gifts that were calculated above on UNICEF's page, the total amount needed to vaccinate 5,353 children against Measles, Tetanus, and Polio is only $4,254.40. This means that Sofie Strandberg was lying to our group from the beginning. The cost per child once you divide the total cost of all 3 vaccines by 5353 is 79 cents, that is IF her intentions were to purchase thru UNICEF USA's site. 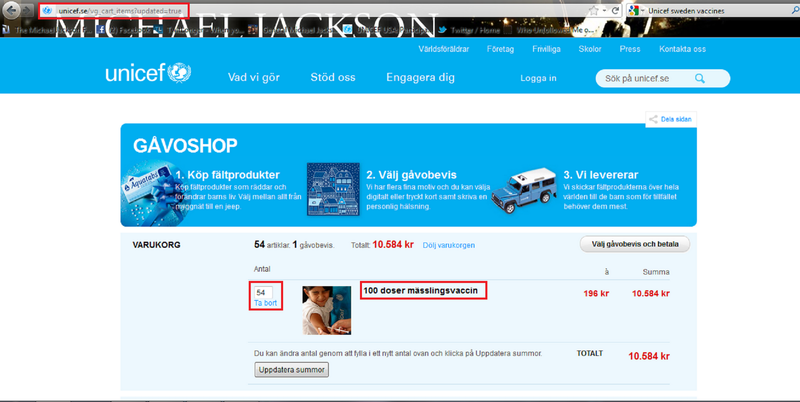 Total for Measles on Sweden site: 10, 584Kr which is approximately $1,530USD. Total for telkrampsvaccin(Tetanus)is 2,268Kr which is approximately $328.00 USD. 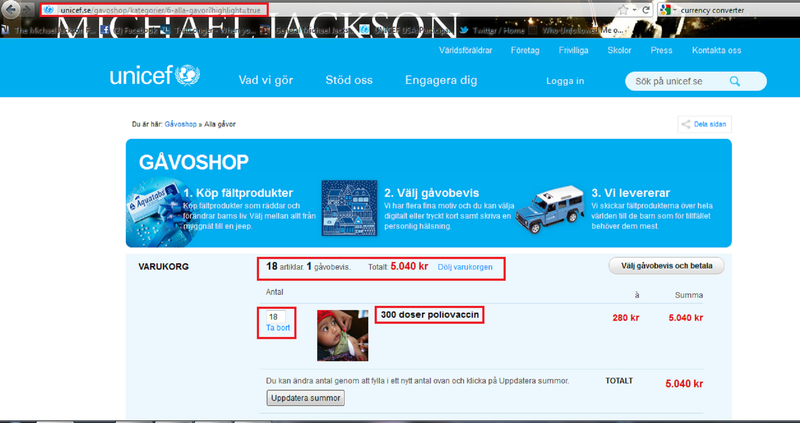 Total for Polio 5,040Kr which is approximately $728.00 USD. Meaning the GRAND total for all three vaccines would have been 17, 892Kr which is approximately $2,585.00USD...that is if Sofie had used Sweden's site instead of the U.S site for UNICEF's Immunization program. The cost per child for all 3 vaccinations, barely $0.50USD...that's barely fifty cents per child to be immunized for all three diseases! What do all these numbers mean? From the beginning as previously stated, Sofie LIED about the cost of immunizing those children. 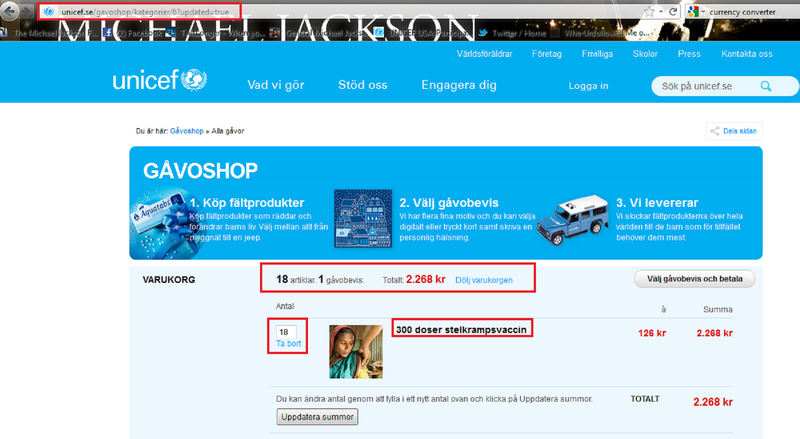 It means, given that UNICEF still denies receiving any donations under Sofie's married name, maiden name, Michael Jackson's name OR One Rose for Michael Jackson's name, Sofie had intentions of stealing anywhere from $6,450.00USD to about $8,000USD from the onset of this project. Remember this vital information as you continue to read this entry because I assure you, that's not even the beginning of this sordid ordeal. Those of us who joined in the efforts to raise money for these immunizations did NOT have the benefit of the above information until AFTER the fact. We were under the impression that Sofie was somebody to be trusted...boy was our trust ever misplaced! It was roughly the first week of September 2011 when Sofie informed the group that enough had been raised to immunize 5,353 children in honor and loving memory of Our Beloved Michael and YET AGAIN, we trusted her words. Why wouldn't we? After all this is the same individual that handled the business of getting One Rose for Michael Jackson started. This is the same gal who as she liked to portray, had single handedly and all by her lonesome arranged for the donations, the purchase, and the delivery of the gorgeous roses that have been sent to Forest Lawn to honor our fallen idol for both of his anniversaries...right? That was our first mistake...not looking deeper. 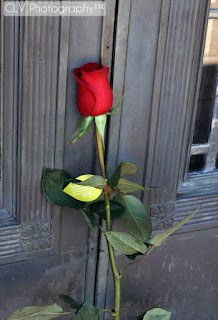 The truth was, the person who was behind the scenes ordering and arranging for the roses purchases and arrival at Forest Lawn, is the co-administrator of the newly reformed One Rose for Michael J. Jackson group...Robyn. Two months came and went and STILL no real word on the progress of the vaccines for the 5,353 children that were supposed to benefit from our efforts. There were brief mentions of the funds arrival to UNICEF being delayed because Sofie would have to transfer the funds into her bank account. We never got a concrete answer on why that was. According to some, Sofie had explained that UNICEF doesn't accept Paypal. However that's not entirely true. UNICEF on the USA side DOES accept Paypal as confirmed to me when I contacted their office in New York and people from any part of the world CAN and HAVE donated to UNICEF USA thru their paypal accounts. This should have been a red flag and for some it was, but for the rest of us, the benefit of the doubt was given to Sofie. Then it was said that Sofie would have to do the donations in smaller increments to avoid paying taxes. This was another red flag, but because 'she did so well with the roses' we continued to give her the benefit of the doubt. November 17th rolled around and we still, as a group, had not been given any concrete answers as to the progress of the Immunizations with UNICEF. Not even when Sofie took the time to write a lengthy post to tell us about her personal woes and illnesses did we get a direct answer to inquiries regarding the vaccines. She was well enough to inform our group of her personal matters, but couldn't muster the strength to answer our questions regarding the vaccines...yet another red flag, but still some continued to give her a chance to settle the situation. December came and finally our eyes were wide open. People began speaking up and voicing their concerns over the fact that some of us had already contacted UNICEF and verified that NO such donation was made by Sofie or any of her aliases or in our group's name. Instead of being met with an explanation, we ended up being met with even MORE deception. Ironically, in her attempts to prove her innocence, Sofie or rather "her mother" ended up proving Sofie's GUILT. It was thru her attempt to pass off what we NOW know to be a falsified "thank you card" from UNICEF Sweden that we found out where the deception from Sofie REALLY began. After a person discovered the site to purchase vaccines for both UNICEF USA and UNICEF Sweden, it all became crystal clear that the entire project to raise money for vaccines was a deliberately, executed scam. We realized that we had been lied to, cheated, and betrayed! Sofie lied about the cost of the vaccines from the beginning. Sofie lied to us at one point and commented that at least HALF of the vaccines had been secured. UNICEF Sweden can verify no donations have been received to date. Sofie misled people into believing that UNICEF didn't accept Paypal and that transferring money into her own bank account was the only means of getting the money to UNICEF for the vaccines. Sofie or "her mother" presented a FALSIFIED document to try to make it seem like she had used the funds appropriately. Sofie has been the root of additional conflict among fellow fans now...those who continue to defend her vs those of us who will no longer stand silent to her lies. For this reason, we are asking every single person who contributed to this project to please come forward and be a voice for the children who were cheated. My next blog post will be dedicated to providing all the information on the proper authorities that we need to make sure are notified. We cannot stand silent any longer and we can no longer afford to give Sofie 'the benefit of the doubt'...not while so many facts are stacking up against her. The members of this group gave Sofie ample time, consideration, and attention, but no more. 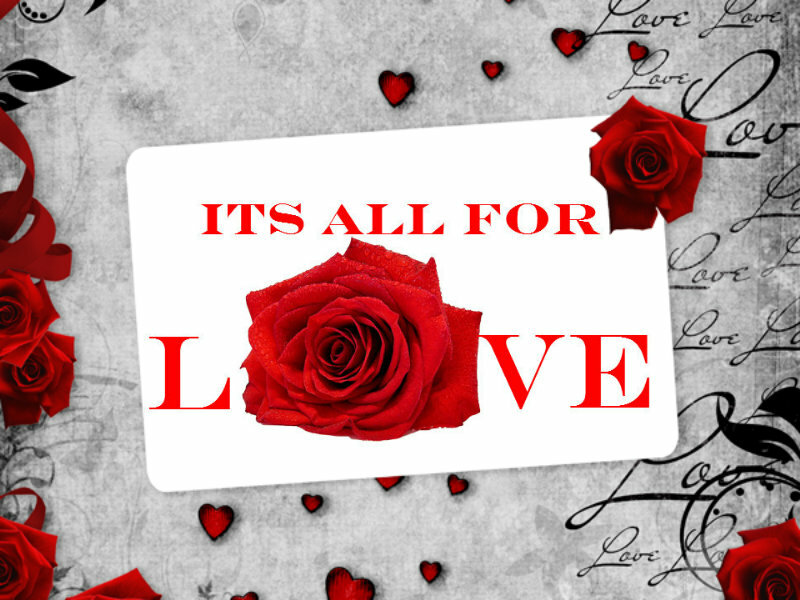 Our focus is no longer on Sofie's well being alone...its much more than that. With all the money that was actually raised we should have been able to vaccinate anywhere from 13,000 to almost 22,000 underprivileged children. So when we raise our voice, we're raising it for more than just 5,353 children...we're raising it for every single child in the world that depends on goodhearted Michael Jackson fans like the ones that formed part of this effort. As a group, there is a greater potential of successfully reaching a resolve. To do this, we would all need to make sure we put forth every individual effort to report this and find the answers and justice we’re seeking. We need to remember, this group is not made up of Sofie alone and any mishandling of funds can reflect badly on us ALL as a group. Condoning this type of behavior leads to everything One Rose for Michael Jackson stands for becoming tainted. People are falling on hard times. Some donated the very little they had to this cause in good faith that the funds would be used for whom they were intended for…underprivileged children. And while some donated $2, others donated higher amounts, I feel its important to remember, what is only $2 to us, is life or death to these children in need of these life-saving immunizations. If you feel that this should NOT be confronted, then I assume you believe we should let GO and let GOD. I urge you to take the time to consider what doing such would do for any future potential projects we’d like to do as One Rose for Michael J. Jackson. Not only that, but what it means for the children who are struggling to survive and could benefit greatly if our prayers are answered and the money is recovered. "Stand up for what you believe in, even if it means you stand alone. Speak the truth, even if your voice shakes. Never regret doing the right thing , no matter what the cost may be. Don't ever let anyone make you feel small or guilty for doing anything of these things. Don't shrink away from standing, or speaking, or doing for fear of the repercussions or personal price. It takes a strong person to not turn the other cheek, to not look the other way, to not just simply walk away." I know this is a tough decision to be faced with because we all want to believe in the greater good of our fellow man. Having said that, I am sending love and healing energy to all because the reality is, the more silent we remain, the more people's questions go unanswered, the more probable it is that we will have no chance of recovering the money that was stolen...money that was supposed to provide a means of a healing childhood for children who otherwise, would have a childhood riddled with disease. Our creed at times is to be "Mike-like," the problem is people only link doing good deeds, forgiveness, and peace to being Mike-like when in reality being like Michael is so much more than all that. Michael stood up and faced the injustices of this world with a strong faith that the TRUTH would always win the marathon. However, to run the marathon, you have to actually get out of the bleachers and raise your voice loud and proudly as Michael did so many times throughout his life and run the race of truth. You have to take action. If not for the children, than at least in the name of justice. If we allow ONE wolf to slip by in sheep's clothing...then what hope is there to prevent other wolves from slipping by? We cause ourselves to be vulnerable the longer we allow these type of injustices to mount and sooner or later it will all come back to us somehow, somewhere...when we least expect it. Kudos Sarrah, brilliantly put. No one has fought harder than you to get to the truth of all of this and to spread the word about Sophie's deception. We all owe you a big debt of gratitude, since I am sure that none of us are aware of the hours you have probably put in to gather all of this info together, along with constructing this blog. OR4MJJ is fortunate to have you and Robyn at the helm and hopefully will now go from strength to strength.